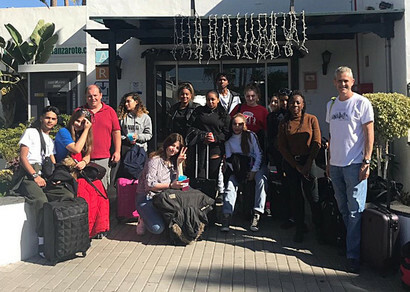 Year 13 BTEC Travel & Tourism students recently visited Lanzarote, a UNESCO Biosphere Reserve, to research evidence to support their Responsible Tourism Unit coursework. Students learnt about the Islands Sustainable Tourism Management such as use of zoning and planning restrictions on building heights, design and advertising by auditing the Puerto Del Carman Resort. Students also attended a Tourism Office Event where we met up with local school children from Arrecife who were promoting the Islands culture and gastronomy. With the sun shining students were up early to tour the Island with a local tour company and local guide where they learnt about the Islands natural attractions and unique volcanic landscapes, as well as visiting centres for culture & tourism set up by César Manrique, a local artist and activist. Their teachers were impressed with the students’ positive attitudes and the way they represented the college during the trip, working together making meals, completing tasks, and getting organised for the visits.